Place a heavy bottomed pan (preferably a griddle) on a high heat. You can choose whether to brush the asparagus spears with olive oil or add it directly to the pan. I generally brush them as it uses less oil. When cooking with olive oil never use extra virgin as the heat alters the properties and taste of the oil. Extra virgin olive oil should be reserved for salads, dressings or bread. The pan should be hot enough so the asparagus sizzles when added. Cook for approximately 5 minutes occasionally turning the asparagus. It should be allowed to to brown slightly along an edge or two in order that it remain tender but the edges will be lightly caramelised. After 5 minutes and with the pan still hot squeeze half a fresh lemon over the top. Add a generous pinch of coarse sea salt (Maldon is the best) and some freshly ground pepper. 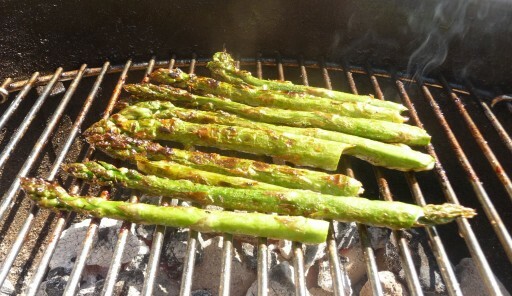 Finally toss the asparagus in the pan so that the seasoning and lemon juice infuse with the asparagus and serve.